The Battle of Harnen Bay (also known as Gauntlet at Has Adri) was a naval battle fought between Umbar and Gondor on 29 Gwaeron, 1663 during the Third Corsair War (1652-1666). The Royal Gondorian Navy suffered heavy losses, losing four warships and six galleys, but Captain of the Ships Elenaerion eventually ensured a Gondorian naval escape through a Umbarean naval blockade composed of units of the Oligarchic Fleets, commanded by Admiral Tarcundo Miruvor. 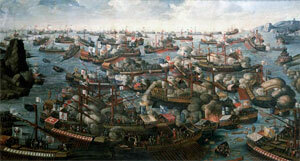 The battle ranks among the largest naval battles in the Third Age. After the successful Battle of Miraz, Royal battlefleet and galley flotilla both retired to Harnen Bay, close Has Adri. To king Tarondor's consternation, unfavourable north-westerly winds prevented the combined Gondorian fleets from sailing to Gondorian-controlled waters. That allowed the pursuing Umbarean forces to encircle and blockade Gondorian ships to Has Adri. The whole sailing force of 123 vessels anchored temporarily between the island of Angast and haven of Has Adri. The sailing battlefleet of 10 galleasses, 6 carracks, and various smaller ships, was led by Flag-Admiral Ercamir Serni, under command of Captain of the Ships Elenaerion. The crack coastal galley flotilla with 8,000 sailors and army soldiers was led by Flag-Admiral Tarlanc Amaltar-Roval, under personal charge of king Tarondor. On 25 Gwaeron, pursuing Admiral Tarcundo Miruvor blockaded the only two navigable channels in and out of Adri Bay and locked the Gondorian fleet while he waited for Prince Sangahyandion and Grand Admiral Angamaitë to arrive from Gobel Mírlond with the Castamirioni galley fleet. This blockade consisted of a primary force of 50 ships and a secondary force of 20 dromons, 8 galleasses and 52 other rowed galleys. By Miruvor's orders, four sets of ships (each with a trailing flameship) were positioned east to west, broadsides to the Gondorian force. In the dangerously shallow western channel sat a set of five chain-linked galleys between Angast and Anannbund (led by Rear Admiral lord Teldûmeir an-Erädas), and five more ships further west. Meanwhile on 26 Gwaeron, 1663, an assault on Barad Harn, ordered by king Tarondor and started two days earlier, failed due to lack of support and returned. Shortage of food and water prompted Tarondor to act. He instructed Captain of the Ships Elenaerion to formulate a plan for the breakout when the winds changed, one which would include a distraction with galleys and an actual breakout at Angast, one which the king would lead personally. At nightfall on 28 Gwaeron 1663 king Tarondor ordered the breakout to commence from Angast on the following day. During the night, Gondorian galleys, led by Dromundhîr Artan Orthallion, assaulted an Umbarean naval unit just west of Tol Mund, trying to divert most of the enemy fleet there. The honour of leading the breakout was given to captain, count Dol-Morn of Lefnui of the full-rigged carrack Remmirath. Dol-Morn led a line of carracks and galleasses away from the bay, through the western channel into the middle of the channel between the shallows and Angast, and towards the first line of Umbarean warships. Three Gondorian caravels, damaged in the battle of Miraz, were converted into fire barges. As the Gondorian navy engaged the Umbarean blockade, first Remmirath and then Morwiniyon were hit by flameships and engulfed in Númenorean fire. Count Dol-Morn perished immediately along his 300 sailors and soldiers. King Tarondor transferred onto a small sloop and was rowed through the fire, but the flagship Valaróma was hit and the Captain of the Ships Elenaerion seriously injured. Once through the first set of ships, Tarondor boarded great carrack Alcarinquë. As the bulk of both Gondorian fleets passed through the blockade, Ensign Saeros, commanding the fire barge Poldorë ("Strength") towed by the galleass Coranar, set his ship on fire too early. It drifted towards Coranar, set it on fire, and then collided with transport ship Norsa and three caravels resulting in an enormous channel-covering cascade of debris and smoke. Umbarean fleets failed to co-ordinate their defence in thick black smoke, and Gondorian great galleasses struck with ease through the blockading dromons. The Gondorian warships surviving the breakout headed into open seas, assembled at Tolfalas, and then sailed to Pelargir for repairs, where they were covered by Princely Navy of Lond Ernil. The loss of many Gondorian ships and hands offset their victory at battle of Miraz. The Royal Navy had suffered casualties that it could not easily recover; both sides reverted to raiding and the war dragged on.